This week, Lennard Zinn addresses questions about tubular base tape, headset spacer stack height, and more. Should I remove this base tape coating if I have decided to use tubular tape instead of glue? The company that makes the tape (Effetto Carogna) says a smooth rim is best. Can I get away with smooth everything (leaving on Vittoria’s coating) or am I just getting lazy? It may work fine without doing anything to the tire, but in my experience, it will adhere better if you prepare the tire’s surface. By the way, many years ago I was having this same discussion with a Vittoria engineer, and he pointed out to me that the coating on the base tape is not latex, but rather neoprene. You do not need to remove the neoprene coating from the base tape, you just need to rough it up to make it tacky. This applies both to glue and to tape; when mounting a tubular with Effetto Mariposa Carogna tape, I do rough up the base tape on Vittoria and Challenge tubulars. I recommend you do so as well. Make sure that you DO NOT rough up the rim, though; you want the rim surface to be very smooth to maximize the surface area of contact of the rim with the tape. The Carogna tape has a thin adhesive on the rim side. To understand the reason for the smooth rim surface, think of sticking Scotch tape to a smooth glass surface (it sticks very well) vs. sticking it to frosted glass (it does not stick as well). Pump up the tire (not on the rim) until it turns inside out. Only pump it enough that the base tape faces outward so you can access it easily. By using the serrations of a table knife or the rough side of a metal file, scrape the base tape of the tubular back and forth until its neoprene coating balls up into little sticky hunks. I have also heard of people brushing rubbing alcohol on the base tape to make the surface tacky. I generally discourage the use of solvents on the base tape for fear of solvent penetrating the tape and dissolving the glue holding the tape onto the tire, although isopropyl alcohol is probably too mild to cause an issue. I have seen tubulars roll right off their own base tape because the tape was not glued well to the tire, even though the tape was well adhered to the rim; let that be a warning to stay away from using stronger solvents on the base tape. Carogna tape has a very thick, tacky surface on the tire side; it conforms to inconsistencies in the underside of the tubular and will easily conform to the roughened, tacky surface of the neoprene coating on the base tape. In your latest article on headset spacers, you addressed the length of spacers and the length of the stem and handlebars and their effect on the loads on the steering tube. Thank you for your emphasis on safety. You may want to add that one way to raise the handlebar is to flip the stem over, a very common practice. Doing this increases the bending moment by the same amount as increasing the spacer height that provides the same handlebar raise. The bending moment in the steering tube at the upper steering bearing is only a function of the forces and their moment arms with respect to the upper bearing center; the geometry in between is irrelevant. Pointing up a 6-degree, 100mm stem raises the handlebar by 20mm (100mm X 2 sine 6 degrees). (A neat formula for mental calculations, the sine of an angle below 30 degrees is equal to 0.1 X angle in degrees/6). However, discounting the failure near the fork steering tube connection, a search on steering tube failure shows that most steering tube failures take place at the end of an aluminum insert. So, if one installs an aluminum insert in the steering tube, that insert should be continuous and secured to the fork. If one, for saving weight, still wants a short insert, the insert being there to resist the stem clamping loads and the moment and side loads at the upper bearing, the lower end of the aluminum tube wall thickness should be tapered on the inside to reduce the stress concentration. I often neglect to include details due to looking through my own filter. Since almost every bike I build goes out with the stem flipped up, it didn’t even occur to me to mention that, since I assumed that would already have been done. But this obviously shows that not everyone looks at it that way. Thanks for pointing that out. With a 130mm, 8-degree stem, flipping it over from pointing down to pointing up raises the handlebar about 30mm. Flipping a 6-degree, 90mm stem changes the handlebar height by about 14mm. Good morning. I just read one of the best answers to a question I’ve ever read anywhere on the web on any topic: Technical FAQ: Headset spacer stack height. A cornucopia of knowledge, wisdom, and respect. I usually avoid posting letters of praise, but this is one of the nicest comments I have ever received. Thanks. That advice on chain hops when backpedaling in the 42-tooth cog was terrible. The tautness, or lack thereof, on the upper part of the chain isn’t the sole problem: it’s largely the chain coming off the cog at an angle vs the chain going on the cog at an angle. Of course it’s not going to fall off from leaving at a large angle because the derailleur has placed the chain securely on the teeth. When backpedaling, the chain is now trying to get on the cog from a large angle, thus acting like the derailleur attempting to upshift. If he rolled the rear wheel backwards while keeping a bit of tension on the pedals, the upper part of the chain would be taut but would still hop down to a smaller cog. The real solution isn’t to “avoid pedaling backward when in low gear.” That’s not even a bad solution, it’s nothing. He already knows not to backpedal in low gears, because the chain is falling off! 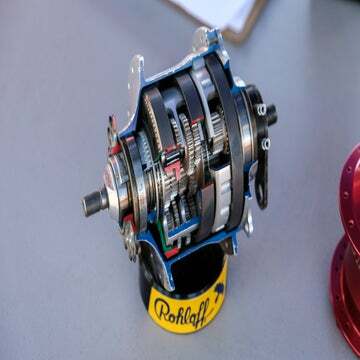 The real solution is to check the chainline of the chainring, and to check the entire drivetrain for wear, since he said it was working initially. 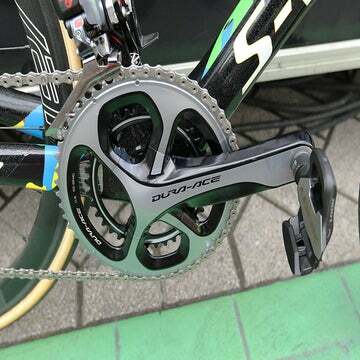 If it was working previously but not anymore, it’s likely that the brand new cassette and brand new chain combined were just enough to fight against a too far outboard chainline, and now that they’ve worn a bit, that incorrect chainline is showing itself. 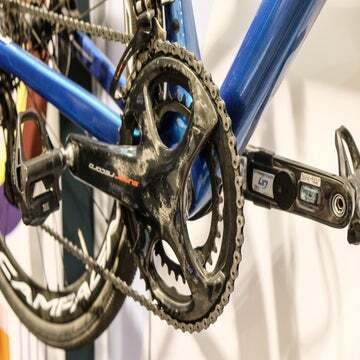 The solution is to use the chainline adjustment in the bottom bracket, or get some spacers for the chainring bolts, to move the chainline inboard a little bit. Start small and check when in the smallest cogs that the chain isn’t binding against the next cog up. Ethan didn’t say if the bike came with 1X. If it didn’t, then there is probably a 50/50 chance that the chainline at the cranks is not perfect, and it only worked initially because the entire drivetrain was fresh and tight. Thanks. I ought to have suggested moving the chainline inboard. As I mentioned above with regard to my own filter, it didn’t occur to me that the bike may not have originally been equipped with a 1X drivetrain.